Potato salad without mayo? Give it a try, you’ll love it! How do we know? Because we have a strong affection for it too. Besides, this is not your traditional potato salad, it is a medley of roasted veggies with crispy-crunchy fresh bites of celery, onion and pepper, and a lime-vinaigrette dressing which holds your expectations together. If you take pleasure in food textures, this salad is definitely for you. You can eat it cold or warm, even use some lettuce leaves as a wrap, and we think that a plate of chicken tenders with avocado dip make a great finishing touch. Sweet potatoes play a ginormous part in Paleo cooking, as they combine just as well with desserts, as they do in stews, they even play their part as delectable fries. What makes the sweet potato nutritious and healthy though? It isn’t so much about the vitamin A – that is better absorbed from animal sources, but sweet potatoes are full of B vitamins, manganese and potassium. An interesting fact: as opposed to the white potato (Solanum tuberosum) the vines and leaves of a sweet potato (Ipomoea batatas) are not only edible, they are packed with a myriad of nutrients and fiber – just don’t confuse the two. If you would like to gain some extra energizing protein in your lunch, add some honey-mustard drumsticks to grab and munch right alongside your salad for a picnic on the go. 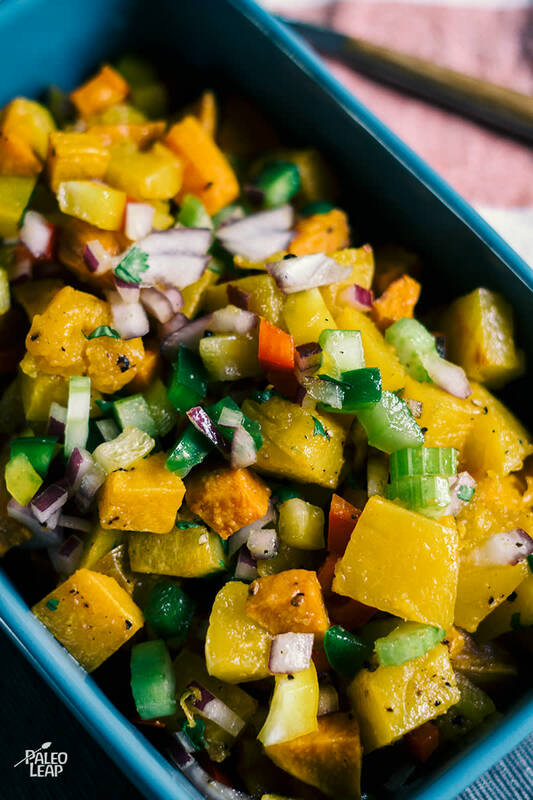 Toss sweet potato, butternut squash, 1/4 cup olive oil, salt and pepper to taste in a bowl. Place on a baking sheet and roast in the oven 25 to 30 minutes, or until fork tender; let cool on baking sheet. In a bowl whisk together the remaining 1/4 cup olive oil, cilantro, honey, lime juice, and season to taste. Place the potato and squash in a bowl once cool. Add the celery onion, bell pepper, cucumber, vinaigrette to the potato-squash mixture. Toss everything and refrigerate until ready to serve.